British broadcasting multi-channel brand UKTV has initiated another collective venture for its 10 networks, collaborating with start-up ‘hybrid TV platform’ YouView to release an official catch-up service for connected TV viewers. 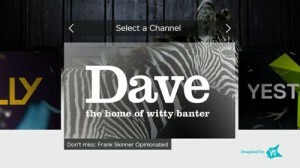 The channels, which are a venture of Scripps International and BBC Worldwide, will for the first time provide content from 3 of their channels (male-based network Dave, female-oriented Really, and history channel Yesterday) in the same location, as well as the first time UKTV has ‘purposely entered’ the market of set-top boxes. Content for Dave is noted as being the first order of business on the free service with a roll-out in July, followed by programming from Yesterday and Really by ‘the end of the year’. Despite its integrated platform across 3 supported networks, the new service not likely to expand to include UKTV’s remaining 7 channels (Alibi, Blighty, Eden, Gold, Good Food, Home, Watch, and new channel Drama as of 8 July), all of them featuring a lower level of accessibility (namely, not being on terrestrial television without a pay-wall) than those featured on the catch-up app.